What is the minimum quantity of 4x6 business card magnets you print? The minimum number of order is 25 pieces. We print 4x6 business card magnets from 25 to 5,000 through offset printing process. What are the possible uses for this size of business card? You can use 4x6 sizes of card magnets as a calendar, small print ad, invitation, a save-the-date, or thank-you card souvenir. 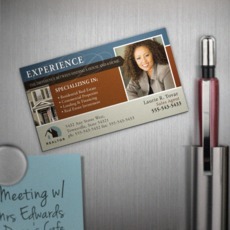 Other business card magnet sizes may be suited for different applications. Do you offer free setup templates? Yes. You can choose from Adobe Acrobat, Adobe Illustrator, Adobe Photoshop, Publisher, PostScript, CorelDraw, and JPEG File setup templates. How much is the fee for file proofing? We offer proofing for free. You can ask for a digital proof with no upfront payment. Send us your ready-made 4x6 business card magnet. Our prepress experts will check your file for technical design adjustments.